I recently saw the film Cave of Forgotten Dreams, and was so taken with the ancient murals that were featured therein. The Chauvet Cave, located in southern France, was discovered in 1994, and is regarded as one of the most important examples of prehistoric art. The drawings are the earliest wall murals known to man, nearly 30,000 years old by some accounts, preserved by the underground conditions, yet hazardous to man as near toxic levels of chemicals are present in the cave; dangerous beauty. 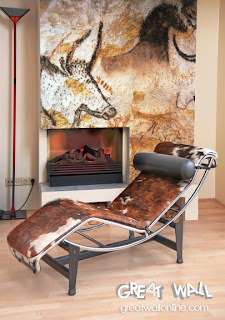 Since these murals are the oldest known to man, I couldn't help bu to envision them printed as wall murals and installed in a contemporary home. The above image is the result of that combination. The mural art effortlessly combines with the cowhide chair and fireplace, alluding to prehistoric materials and life that would've occupied the cave. Learn more about creating your own custom wall mural by visiting our website, where you can upload your own photo for a mural, or use one of our standard murals, which may be customized as well. One of my favorite toys growing up was Hasbro's Spirograph. If for some reason you are unfamiliar with Spirograph, it is a toy that uses pens and gears with a mathematical basis to create circular, looping curves. Officially these mathematical shapes are called hypotrochoids, but with the ability to create infinite shapes and patterns with a multitude of colored pens, I always just called it fun. Using this nostalgic reference to the toys of childhood as our reference point, we present to you a unique wallpaper pattern that harkens back to those hours spent hunched over the Spirograph. Shown in black and white to coordinante with our inspiration room, this graphic wallpaper features undulating circles of hypotrochid shapes in various sizes. The oversized pattern gives the custom wallpaper a mural-like effect with it's bold presence, but recedes enough into the background so as not to completely dominate the room's decor. A custom wallpaper design that combines nostalgic elements with high design is a winner in our book; what nostalgic inspiration would you use to create a custom wallpaper pattern? Contact us to learn more about our wallpaper design services! Today's custom mural inspiration piece focuses on nautical maps. We have produced hundreds of map murals; the custom map murals we have produced are oftentimes for clients who live on the East or West coast, and are typically nautical charts of their nearby waters. The mural image in this inspiration piece is of the Carta Marina. The Carta Marina, Latin for Map of the Sea, was drawn in 1539 by Olaus Magnus, the first detailed map of Nordic waters. The mural highlights the intricacies and obstacles that imperiled seamen in the 16th century, including treacherous currents, whirlpools, and even sea monsters! 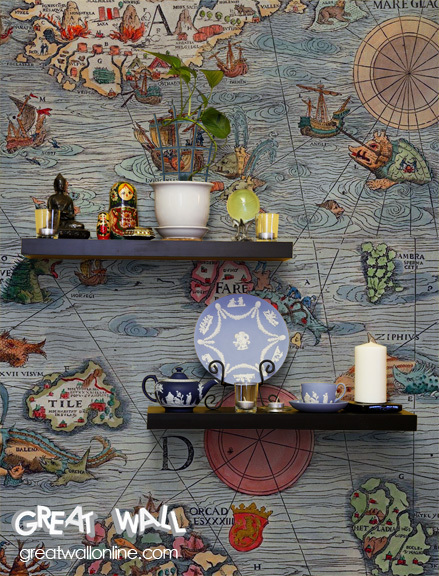 Nautical themed wallpaper works wonderfully with eclectic world decor; baubles and trinkets from around the globe accentuate the travel theme engendered in a map mural. A few months back we were contracted to photograph a number of industrial machines housed at a machine shop. The interior designers at Art Harrison were assisting the company by bringing their decor up to more modern standards, which included a series of photos we shot produced as art pieces. The pieces featured the images of the machines at abstracted angles, turning everyday tools and equipment into art. We have used one of these images as an inspiration mural for the room above, which features a series of concentric circles; the brushed metal finish adds even more visual interest to the custom mural. For all of you stargazers out there who are looking to add touch of cosmic fancy to your walls, check out this lunar surface wall mural. 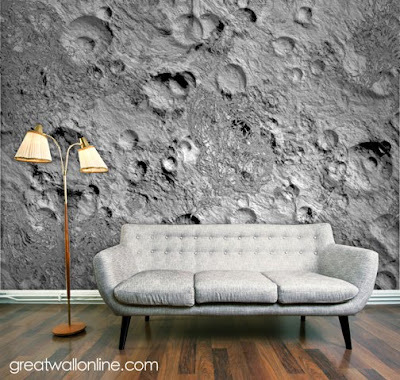 The mural simply uses a photograph of the moon's surface, in all of it's cratered and crusty glory. 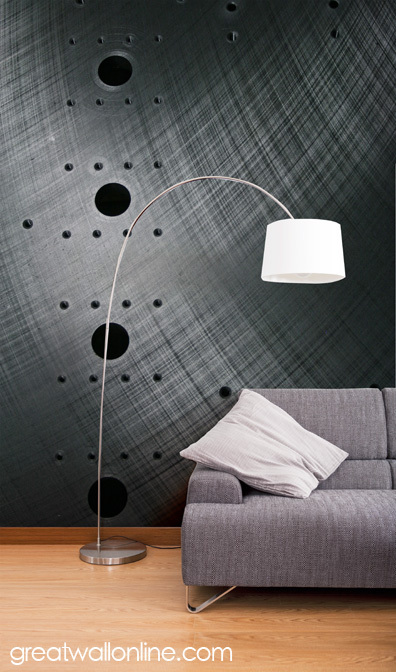 The mural adds subtle texture while still being instantly recognizable as the moon. There are scores of different shots of the moon that could be used for a custom mural, with more crater impacted areas for a dramatic look, to the seas of the moon which will offer a more static appearance. Want a space mural that is inspired beyond our solar system? Contact us for more custom wallpaper design ideas from our galaxy and beyond. We just got some press that we're exited about! Our Wallgazer line of contemporary wall murals was recently featured on Retail Design Blog. Their blog assists retail designers and visual merchandisers by providing news and information about retail trends and solutions. Check out the article about our wall murals here! 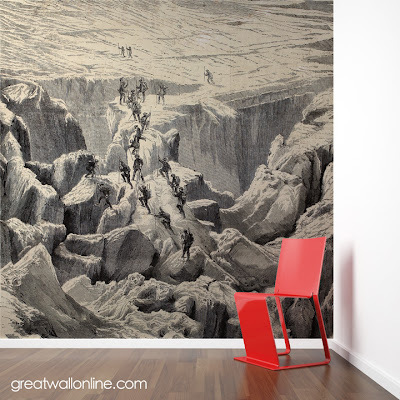 Today we are sharing an inspiration piece that uses vintage artwork for a wall mural. The artwork is a lithograph from the mid 1860's, and depicts a scene of mountain climbers on Mont Blanc in the alps. This wall mural could be customized fully to coordinate with your decor, from adding a color wash over the image to washing out the detail and saturation to create an even more subdued look. Do you have a vintage image that you'd like to incorporate into your decor scheme? Contact us to learn more!